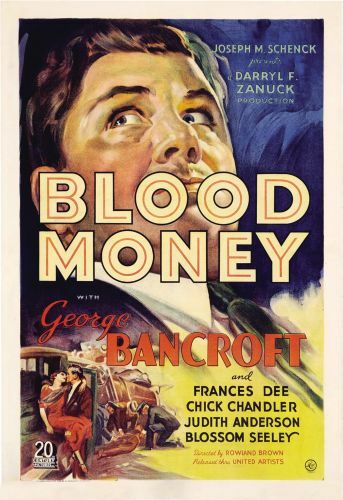 Roland Brown's Blood Money (1933) has lost none of its ability to entertain and startle over the seven decades since its release. The title refers to the business of affable, ambitious bail bondsman (and politically-connected grifter) Bill Bailey (George Bancroft), who, in the course of his work, crosses paths with every kind of offender there is, from first-time defendants to career criminals. Among the latter is Drury Darling (Chick Chandler), the brother of Bailey's paramour, nightclub owner Ruby Darling (Judith Anderson). Bailey is popular enough in the criminal world, over his providing the means for gang members to stay in circulation while awaiting trial, and he knows how to spread the money around to make the wheels of government run more smoothly (and not run over any of the speakeasies, casinos, clip-joints, and other enterprises of the gangs to which he is closest). Then, one day, he meets Elaine Talbert (Frances Dee), a thrill-seeking socialite whose penchant for excitement has ratcheted up from shoplifting in the better stores to fast cars and fast men. Bailey doesn't quite know what to make of her -- she's attractive enough, and drawn to him, but her lust for illicit and dangerous diversions runs counter to the common sense that he applies to his life, every place but where women are concerned. His quasi-legal and extra-legal maneuvering is fun for a while, but what she really wants, as she tells Bailey, is a man who will "take charge" and dominate her, physically and in every other way. Eventually, she tires of the middle-aged Bailey and gravitates toward Drury Darling, whose exploits as a bank robber, willing to fight the law head on, are more in line with some of the excitement that she craves. When Darling is arrested, he depends upon her to pass along the money that Bailey needs to bail him out, and that's when the smoothly operating life that Bailey has arranged for himself grinds to a halt. A cache of worthless bonds, a war within the underworld itself, and an assassination attempt on Bailey are just part of the double-dealing and blood-letting that ensues, climaxing with game of pool involving a booby-trapped eight ball (a variation of a famous sequence from Keaton's Sherlock Jr., later re-used by the Three Stooges in I'll Never Heil Again). And the finale for Elaine Talbert is a sequence that might not even have gotten past the politically-correct censors of the 1980's.